Cynthia Ong is creating an equitable, diversified, and circular economy in Sabah on the island of Borneo—one of the most biodiverse regions on Earth. Cynthia Ong is creating an equitable, diversified, and circular economy in Sabah on the island of Borneo—one of the most biodiverse regions on Earth. She does this by using a new leadership style, where all voices have equal power to co-create solutions to regional problems, as competing interests of profit and conservation contend for the same pool of resources. Cynthia's New Idea: Through her organization, Forever Sabah, Cynthia uses the power of distributive leadership—a shared process that considers the expertise of people at all levels to address a situation—to develop solutions for more effective conservation and sustainable development in Sabah. This process breaks down barriers between government, private business and the citizen sector, and allows people with seemingly competing priorities to recognize their connections and importance to everything within a greater web of sustainability. Skillful listening to previously unheard or marginalized voices—such as indigenous smallholder farmers, or people who are angry about the standards for palm-oil production—and then including these voices in collaborative discussions yields more powerful and encompassing solutions. As this style of leadership gains more and more traction in the business world, Cynthia’s innovation is applying this inclusive approach to solving challenges facing an entire region; she facilitates discussions between residents, government representatives, private businesses and conservationists to build a coalition of partners. A fluid process, everyone’s opinion is sought and considered with an open-ended resolution— Forever Sabah does not try to persuade people of a preconceived solution or an idea; it is up to the parties involved to reach a decision and a path foward. Cynthia believes in the process to generate the best results for the people affected. In a larger sense, the movement strengthens the conservation capacity of the community in Sabah and effectively addresses many long-standing problems that the territory has faced due to its unique and diverse environment. 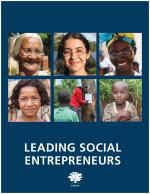 Cynthia' s story appears in the 2018 edition of "Leading Social Entrepreneurs" which features a selection of just a few of the Ashoka Fellows recently brought into the largest global network of social entrepreneurs. The LSE presents some of the newest innovations by leading social entrepreneurs whose ideas are changing the way things are done all over the world.